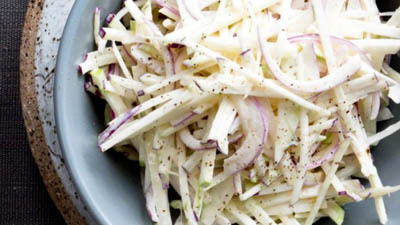 The trick to a good apple slaw is getting those beautiful matchstick apple slices. (Dana Ewart shows us how to do that in her video for Deconstructed Waldorf Salad.) The second trick is to not overdo it with the dressing. An overdressed salad can be visually unappealing (we eat with our eyes first!) and can hide the delicious Ambrosia apple flavour. This recipe also calls for kohlrabi. If you’ve never tried this vegetable before, then this is the ideal introduction. Kohlrabi is a bit of a funny-looking vegetable. It’s body is spherical in shape and it has a few green leaves growing antennae-like on top. Like cabbage, it comes in vibrant purple and bright green but once you cut them open, both colours have white flesh inside. It tastes a bit like a combination of broccoli stem and cabbage. Although, some say they detect a turnip taste. When served raw, as it is in this recipe, it has a satisfying crunch just like Ambrosia apples. We love that they’ve thrown a little bit of green chili into this recipe because it adds some nice heat to the finished dish. If you’re not a fan of spicy foods, then you can simply leave this out. The kohlrabi’s cabbage-like savoury taste already balances out the Ambrosia apple sweetness perfectly. They suggest serving it with pork loin but we’d be happy to see it beside anything. That’s the beauty of a perfect picnic or potluck dish – it’s great on its own but it can also blend in with just about anything. Here’s the link to the recipe. It calls for apples but we know that the best choice for apples is Ambrosia, right?